The book I’m featuring today is by my friend and part-time Ninja, Carmella Van Vleet! It’s a great story about taekwondo and not giving up. Carmella also has a very cool “Black Belt in Kindness Club” on her website that kids can join when they do something nice for a friend. In this uplifting novel about determination and the rewards of hard work, a preteen girl struggling with ADHD must stick with a summer taekwondo class to prove that she’s dedicated enough to pursue her true passion: cake decorating. Eliza’s personality really shines in this story. It’s fun reading about the trouble she gets into and how she tries to get herself out if it. I also enjoyed the fact that her parents and family were in the story and supporting her, even though Eliza solves her own problems. (None of that “dead parents” syndrome common in many middle grade books.) It was great to read a story where the main character has a disorder (ADHD), but where coping with it isn’t the main focus of the story. As a writer, I think this would be a great book to study if you’re working on creating a unique character voice. It’s also interesting that the book is organized in short sections rather than chapters, which fits with Eliza’s personality and her ADHD. Carmella Van Vleet is a full-time writer who lives in Ohio. She writes non-fiction as well as fiction. 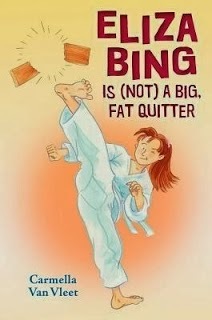 Eliza Bing is (Not) a Big, Fat Quitter is her debut middle grade novel. Carmella talks about writing non-fiction for middle graders in an interview for Middle Grade March. For more, visit Carmella Van Vleet’s website. After reading The Awesome, Almost 100% True Adventures of Matt & Craz, I wanted to have a magic pen (but for writing, not drawing)! This was a really fun story, a great way to end off my project to read all of the nominees for the 2014 Silver Birch Award. Now I can settle back and see which one kids will pick as the winner – the official voting day is this Wednesday. It won't be an easy choice. I had fun reading this story about two friends, their magical pen and their crazy schemes to get their comics noticed (and all the trouble that got them into). The story moved along quickly and held my attention. 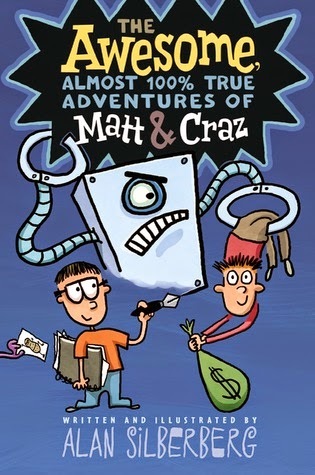 The humor was fun and the problems that Matt and Craz encountered seemed totally appropriate for the situation and their age. As a writer, I was thinking of re-reading this story to help me with structuring one of my own novels, since I liked the pacing. Alan Silberberg is a cartoonist/TV writer who lives with his family in Montreal, Canada. For more, visit Alan Silberberg’s website. If you’re interested in what I have to say about the Silver Birch nominees, I’ve posted about each one: Eldritch Manor by Kim Thompson, Nobody's Dog by Ria Voros, Ultra by David Carroll, The Curse of the Dream Witch by Allan Stratton, The Hypnotists by Gordon Korman, Record Breaker by Robin Stevenson, Yesterday’s Dead by Pat Bourke, Neil Flambe and the Tokyo Treasure by Kevin Sylvester and The Metro Dogs of Moscow by Rachelle Delaney. Two members of my extended family have gotten new dogs recently and all the dog-meet-dog interactions are fun to watch. 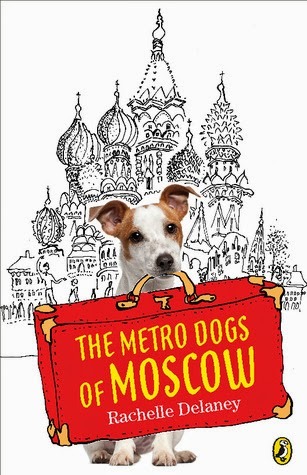 They definitely put me in the right mood for reading The Metro Dogs of Moscow, another one of the fiction nominees for the 2014 Silver Birch Award from the Ontario Library Association. JR (short for Jack Russell) is an embassy dog. His human, George, works in embassies around the world and so they both travel. A lot. Now George is working at the Canadian Embassy in Moscow. While George loves the globetrotting life, he doesn’t think JR needs any more excitement than hanging out at the park with the other embassy dogs. JR, however, has had quite enough of leashes and perfectly manicured parks—not to mention the boring embassy dogs. Inspired by seeing a stray dog steal a coil of sausages, JR sneaks out of his apartment to do a little exploring on his own and soon meets up with the wily stray and some of his friends. This is the life: amazing city smells! Mouthwatering stuffed potatoes! And best of all, the freedom to travel on the Moscow subway. But then JR's new friends mysteriously start to disappear. When an embassy dog goes missing as well, JR knows he must use everything he’s learned about his new home to solve the mystery of Moscow’s missing dogs. It’s always interesting to read stories that are narrated from a very different point of view—in the case, a dog’s perspective. JR was a fun character to tag along with on an adventure. I especially enjoyed the setting. I learned a little bit about Moscow and Russian food while reading this book. I haven’t read many middle grade books set in Russia before. I like the bits of humor the author sprinkled into the story. As a writer, I thought the writing style captured JR’s doggy personality. The phrasing and word choice kept me anchored in the dog’s perspective. When she’s not writing novels, Rachelle Delaney enjoys adventures like tree climbing, trail running and snowshoeing. On her website, Rachelle mentions that she was inspired to write this book after reading a newspaper story about stray dogs in Moscow that ride the subway. Rachelle Delaney's new adventure with JR and some of his dog friends, The Circus Dogs of Prague, is being released at the end of April. For more, visit Rachelle Delaney’s website. If you’re interested in what I have to say about some of the other nominees for the 2014 Silver Birch Award, these are the ones I’ve read so far: Eldritch Manor by Kim Thompson, Nobody's Dog by Ria Voros, Ultra by David Carroll, The Curse of the Dream Witch by Allan Stratton, The Hypnotists by Gordon Korman, Record Breaker by Robin Stevenson, Yesterday’s Dead by Pat Bourke and Neil Flambe and the Tokyo Treasure by Kevin Sylvester. One more to go! For more great middle grade reads, check out the list of Marvelous Middle Grade Monday links on author Shannon Messenger's blog! 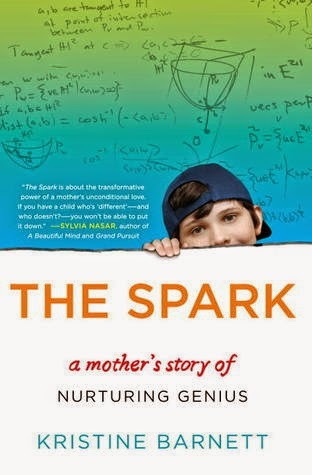 Inspiring Creativity Through "The Spark"
This morning, I finished listening to the audio book of The Spark: A Mother's Story of Nurturing Genius by Kristine Barnett. It's not a children's book, although my 14-year-old heard snippets of it in the car and seemed just as fascinated as I was. It's the story of Jake, who became a researcher in quantum physics at the age of twelve, and his family, especially his mom, who nurtured his genius and helped him learn to live with his autism. Two things about this book really stood out for me and inspired me. 1) It got me thinking about what you can achieve if you put your energy into doing what you love. 2) It reminded me of the importance of having a strong support system, one that provides the right environment for the spark to develop. As a mom, I loved the way Kristine and her family supported her children's interests, giving them what they needed so they could explore and discover on their own. It makes me think about my own children and their "sparks" are, and making sure they have time to follow them. As a teacher, I loved this story because it fits so well with what I strive to do every day in my teaching in play-based kindergarten, for even just one child. As a writer, reading this book inspired me to keep following my passion. I'm already thinking about ways to nurture my own creativity and "spark", as well as the creativity of others. How do you feed your "spark"? World-class chef Neil Flambé isn’t thrilled when his cousin Larry moves to Japan to work on an online manga comic book. Now who’ll help him in the kitchen? But he finds a replacement in Gary the bike courier, and life, and the restaurant, moves on without Larry. That is, until the news that life may have really left Larry behind—he’s been lost at sea. Neil is devastated. But then he checks Larry’s online manga. There’s a subtle change in the plot, something Neil and Larry had discussed—something only Neil would notice. Is this a cryptic message from beyond the grave—or is Larry still alive? Determined to find out, Neil heads to Japan to solve his next mystery. 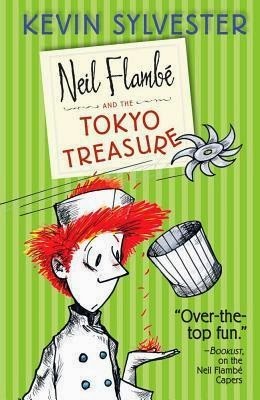 This story is full of the over-the-top adventure that I’ve come to expect in the Neil Flambé series. I always have fun reading about Neil’s cooking exploits and his attempts to save someone he cares about from danger—in this case, his cousin Larry. I like the way Neil’s keen sense of smell always leads him to a key clue in solving the mystery. As a writer, I admired how the author creates such a great sense of fun and humor in his stories. It's a good one to read if you are struggling with how to include the sense of smell in your writing. Kevin Sylvester is a writer, news broadcaster and cartoonist based in Toronto, Canada. The character of Neil Flambé was originally part of a radio serial Neil Flambé and the Case of the Caustic Cumin. I'm continuing with my goal of reading all of the nominees for the 2014 Blue Spruce Award from the Ontario Library Association's Forest of Reading. Other nominees I've featured so far include Oddrey by Dave Whammond (OwlKids Books), I Dare You Not to Yawn by Helene Boudreau (Candlewick Press), A Good Trade by Alma Fullerton (Pajama Press) and Sky Color by Peter H. Reynolds. 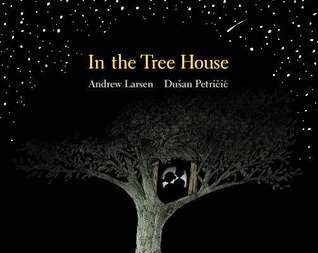 An evocative story about two brothers who are growing up (one faster than the other), an unusual summer night and a special tree house that proves childhood is not just a time but also a place. I think many children dream of having their own tree house -- I know I definitely did! It was really interesting the way this book took a beloved place (or idea of a place) and built a story around it. The author includes lots of sensory details in simple language that is perfect for young children. I liked the way there were layers to the story with the emotion of the changing relationship between the main character and his brother. The illustrations capture the personality of the tree house as well as the characters. This book offered many possibilities for making inferences (e.g., Why did they have to eat the ice cream during the blackout?) and personal connections (e.g., Have you ever experienced a blackout?). This book could be used to start discussions about siblings or changing friendships, loneliness, and things to do when you don’t have the use of technology. It would be fun to have students draw their own plans for an ideal tree house.